Stylish, sweet, and sophisticated, macarons are the quintessential Parisian treat. Though they can be quite simple, with naturally gluten-free dough made from almond flour, egg whites, and sugar, macarons can also get beautifully complex. Traditional fillings include buttercream and jam, while some of the more avant-garde pastry chefs incorporate some surprising ingredients into their confections (see below). 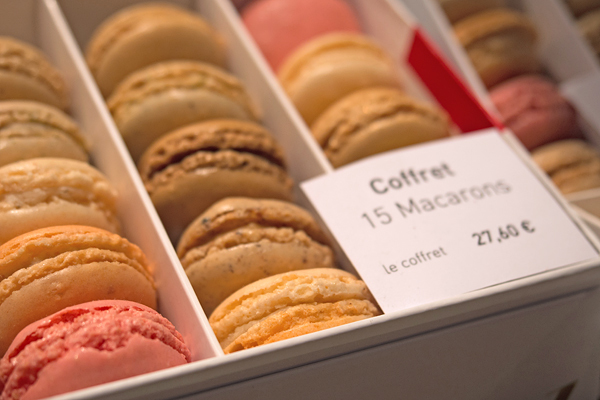 From traditional to contemporary, here are our top three macaron shops in Paris. 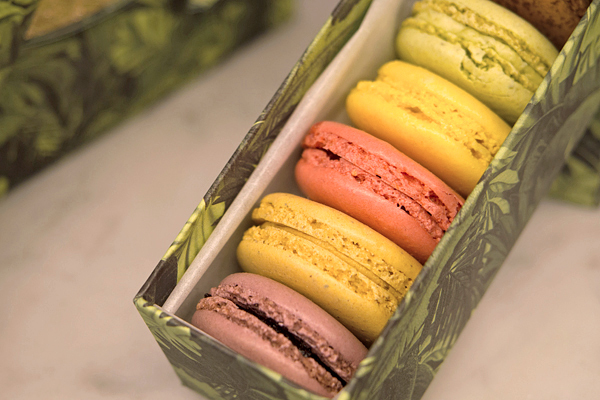 Many macaron lovers make Ladurée their first stop, and for good reason. This patîsserie and tearoom has been a Parisian institution for over 150 years, and it’s often credited with creating the macaron as we know it today. When you visit, you’ll be amazed by the lavish tearoom and display area, along with the beautifully presented and packaged pastries. Macarons are available in classic flavors like pistachio and raspberry, along with more contemporary flavors like rose petal and licorice. 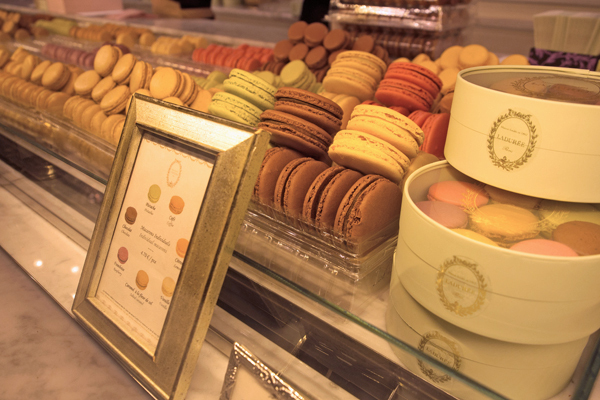 We loved Ladurée’s rich salted caramel macaron. One of the most regal places to enjoy a pastry or two, Dalloyau has been linked with the French court since the days of Louis XIV. Though this family of bakers is best known for creating the famous opera cake (unfortunately not gluten-free), Dalloyau also makes stunning macarons. Here you can enjoy these delicate pastries with a little sparkle—many are topped with a tasteful selection of sprinkles or sugar to complement the flavor. Be sure to try the seasonal flavors, like strawberry with apricot or orange with mango. 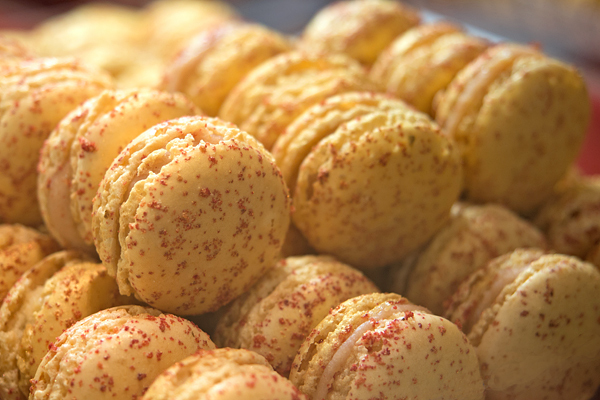 Dalloyau’s festive champagne macaron is a must. Established just 20 years ago, Pierre Hermé has quickly risen to the top of the Parisian pastry and chocolate ranks, and the patîsserie makes a name for itself with its avant garde flavors. You’ll be dazzled by the contemporary look of this shop, along with its brightly colored macarons, many coated with an iridescent sheen. You won’t find much that’s traditional here, but the passion fruit and dark chocolate varieties are a good start. For flavors that are truly out of the box, try one of the foie gras or olive oil with mandarin orange macarons. We loved Pierre Hermé’s light, flavorful rose macaron. 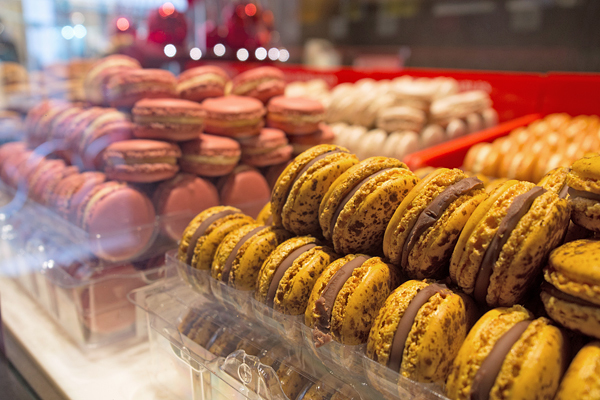 Which of these top macaron shops in Paris will you visit? We recommend taking a leisurely afternoon to sample them all, from the classic to the avant garde! Where? You’ll find these patîsseries throughout Paris. Visit Ladurée at 75 avenue des Champs Elysées, 75008 Paris (+33 01 40 75 08 75). Visit Dalloyau at 5 boulevard Beaumarchais, 75004 Paris (+33 01 48 87 89 88). 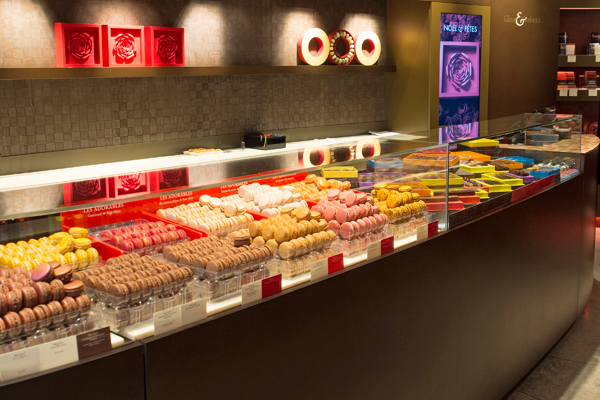 Visit Pierre Hermé at 4 rue Cambon, 75001 Paris (+33 01 43 54 47 77). All of these macaron shops have multiple locations, so you’ll find them elsewhere in the city as well.